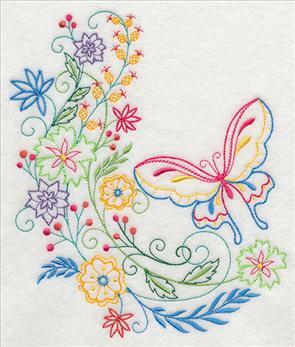 Celebrate the new year with beautiful embroidery designs, and make something marvelous, just for you. 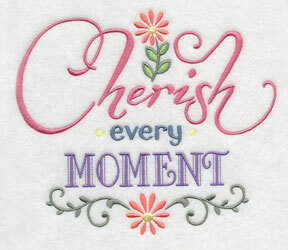 Below you'll find a stylish selection of new embroidery designs that encourage us to revel in every moment, and bring joy to each day. Some are sleek and stylish; others are bold and dramatic. 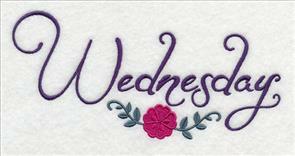 It's a fun variety, perfect for launching a creative year of sewing and embroidery. Scroll down the page to see the variety! 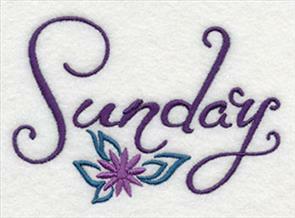 You'll find affirming and uplifting phrases, quick-stitching days of the week designs, and vibrant, abstract flowers and snowflakes. 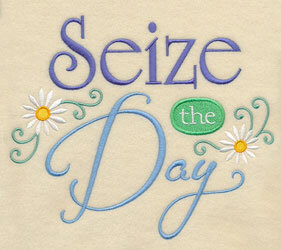 to bring their positive message into each and every day! 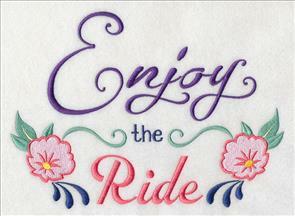 Stitch sweet sentiments onto wall hangings, mini-quilts, tote bags, and pillow covers. 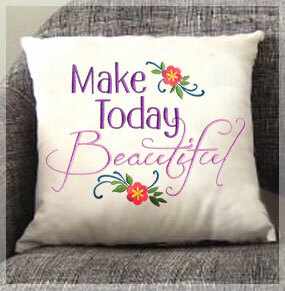 Spread positive and uplifting messages throughout your home. 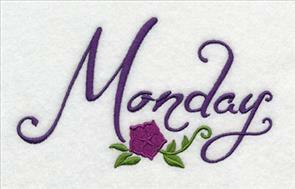 Elegant lettering brings an eye-catching and dramatic look to your projects, along with a wonderful message. Add to tote bags to show your positive spirit wherever you go! 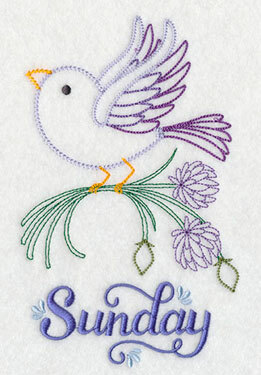 The designs are beautiful in quilt blocks, too. 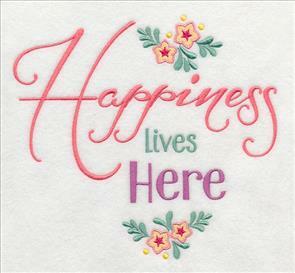 9.53" x 6.91" and 7.81" x 5.67"
7.82" x 6.68" and 6.85" x 5.85"
5.69" x 4.85" and 3.87" x 3.39"
"Happiness Lives Here" and "This Is My Happy Place" are ornate and uplifting messages. 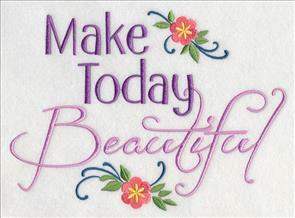 Make mini-quilts and wall hangings to decorate your sewing room! 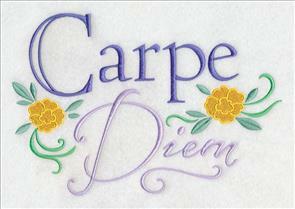 7.53" x 6.91" and 6.39" x 5.86"
7.75" x 7.83" and 6.91" x 6.99"
5.86" x 5.93" and 4.86" x 4.91"
Carpe diem is a Latin phrase that means "seize the day." Pledge to make the most of every moment in 2015! Stitch these affirming quotes onto tote bags and tea towels, and frame them, too. 10.03" x 6.91" and 7.81" x 5.39"
7.81" x 6.54" and 6.99" x 5.86"
5.80" x 4.86" and 3.87" x 3.35"
Revel in the present moment with these designs on tees and more, reminding you to enjoy the ride because it's a beautiful day! 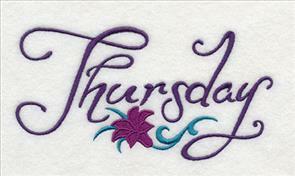 9.49" x 6.91" and 7.81" x 5.69"
7.83" x 7.54" and 7.13" x 6.85"
6.13" x 5.89" and 5.06" x 4.86"
Stitch these sweet sentiments onto wall hangings, mini-quilts, tote bags, and pillow covers. Order the designs singly by using the links above, or get all eight in a design pack. Elegant and colorful sprays are dramatic additions to your projects. 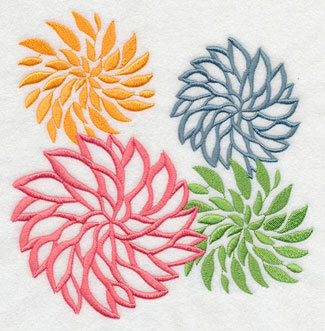 They're a stunning way to fill the space on pillow covers and placemats, too. 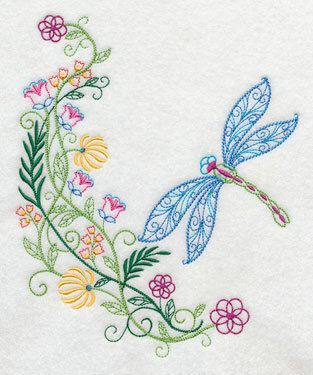 Butterflies, hummingbirds, and dragonflies bring a lively look to your garments and home decor projects. 6.42" x 7.78" and 5.82" x 7.05" and 4.85" x 5.87"
6.48" x 7.80" and 5.86" x 7.04" and 4.89" x 5.88"
Bold, and beautiful! 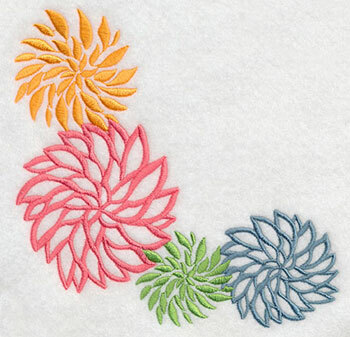 Let your creativity bloom and stitch these funky flowers on shirts, skirts, and cardigans. We used orange, pink, blue, and green for the samples that you see here. Experiment with different colors - the possibilities are endless! 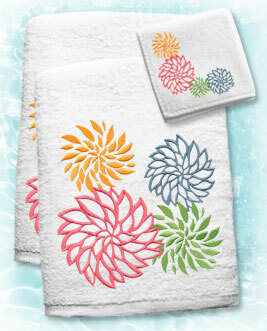 Light and open yet full of lively color, these flowers are just the thing to bring joy to a coordinating towel set. 7.72" x 7.79" and 6.89" x 6.96"
5.84" x 5.90" and 4.86" x 4.91"
Grow an abstract garden on table linens, quilts, pillows, and more with this border of blossoms! 11.75" x 4.68" and 9.41" x 3.75" and 7.81" x 3.11" and 5.98" x 2.69" and 3.86" x 1.54"
Tuck these vibrant blooms, full of color and cheer, into the corner of napkins, towels, and more! 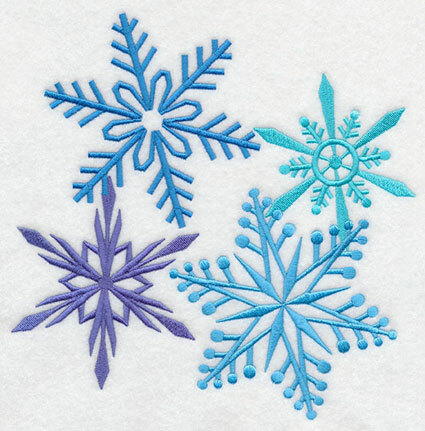 5.87" x 5.90" and 4.91" x 4.93" and 3.85" x 3.86"
Dress up sweatshirts, jackets, and cozy quilts with these frosty snowflake designs! 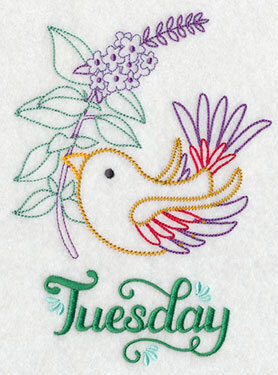 Stitch in a traditional winter palette and hues of blue, or choose hot colors like pink, purple, and lime green! 7.80" x 7.77" and 6.93" x 6.90" and 5.87" x 5.85" and 4.86" x 4.84" and 3.86" x 3.84"
Add a fashionable look to garments and home decor with this brilliant snowflake border! 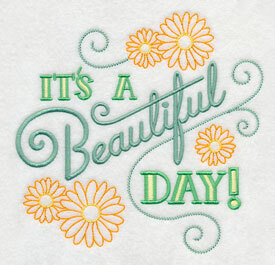 It'll be dazzling on towels, tablecloths, and more. 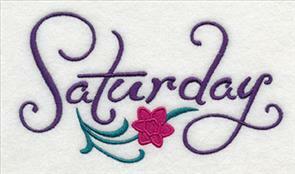 Repeats beautifully! 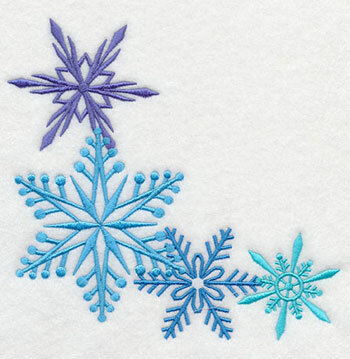 11.75" x 4.64" and 9.40" x 3.71" and 7.80" x 3.08" and 6.00" x 2.56" and 3.86" x 1.52"
Shining satin stitch snowflakes are lovely in the corners of napkins for a wintry dinner party. 5.85" x 5.85" and 4.85" x 4.86" and 3.85" x 3.85"
In our neck of the woods, watching birds in winter is a favorite pastime. 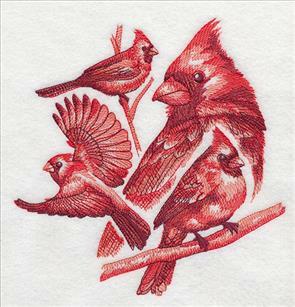 Cardinals and blue jays are fun to spot against snow-covered pine boughs! These sketch-style designs feature the birds in several different positions, enhancing their beautiful form. Sketch-style designs are light with open areas. 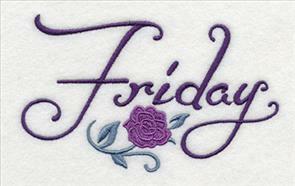 Choose smooth, neutral fabrics (denim, quilter's cotton, duck cloth, linen) for excellent results. 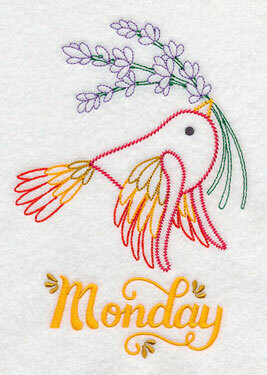 8.54" x 6.91" and 7.24" x 5.86" and 5.97" x 4.83"
Light and quick-to-stitch day of the week designs are a fun way to brighten up tea towels. 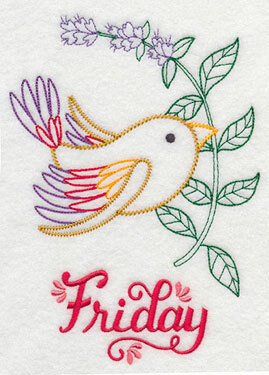 Find tea and flour sack towels at Target, Kohl's, TJ Maxx, and Home Goods. 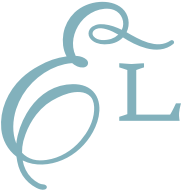 Online sources include JoAnn's (the Aunt Martha's brand), All About Blanks, and The Sewphisticated Stitcher. They're quick to stitch, with only a few color changes. 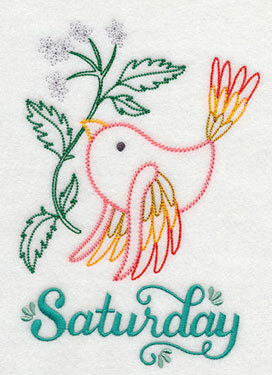 Use a medium-weight (2.5 ounce) cutaway on the back, and a size 11 sharp needle, and you will get picture-perfect results! 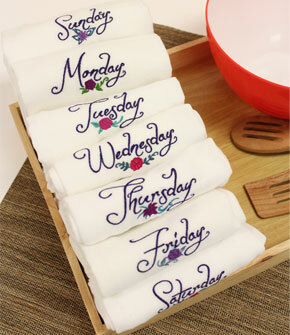 Brighten up your kitchen with a fresh tea towel for each day of the week! 4.04" x 2.81" and 2.46" x 1.71"
4.81" x 2.85" and 2.93" x 1.74"
5.40" x 2.85" and 3.59" x 1.90"
4.92" x 2.83" and 2.99" x 1.73"
Add days of the week designs to flour sack and tea towels for a refreshing addition to the kitchen. Order the designs singly by using the links above, or get the pack with all seven designs. 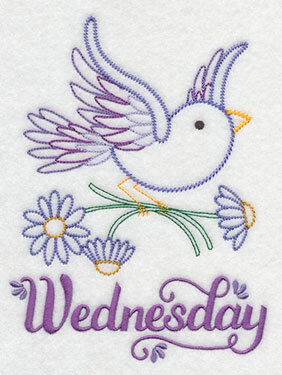 Seven little birds carry sprigs of herbs. 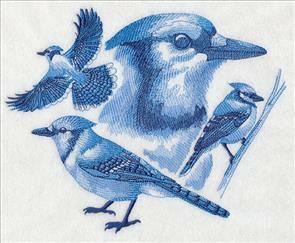 They're ready to fly onto your kitchen towels! 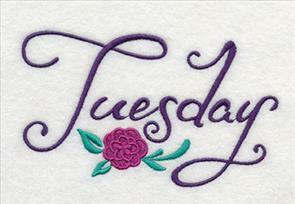 Thanks goes to Marcy K. who wrote in to request these designs. 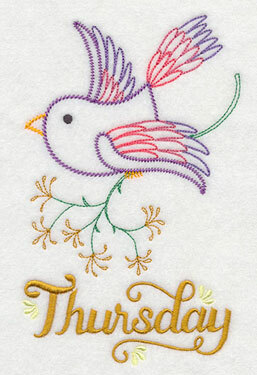 She saw the Baking Birdie designs and asked for seven more to stitch a set of kitchen towels. 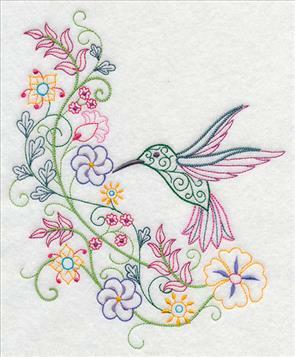 Vintage designs are light and open, reminiscent of hand embroidery. They're a perfect match for smooth fabrics, like tea towels, linen, and quilter's cotton. 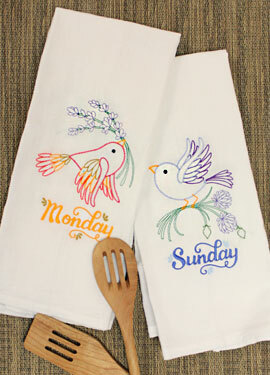 Let a new little bird fly into your kitchen each day with cheery, colorful flowers on tea towels! 4.23" x 6.85" and 2.39" x 3.87"
4.85" x 6.64" and 2.81" x 3.88"
4.38" x 6.85" and 2.47" x 3.87"
4.76" x 6.85" and 2.67" x 3.87"
Colorful birds and herbs are a treat to stitch on flour sack and tea towels. Order the designs singly by using the links above, or get the pack with all seven designs.